What is included in being an ANTS Tennis Affiliate? Legal use of the ANTS Tennis name, logo, and promotional materials. Access to the ANTS Tennis coaching and business philosophy. One-on-One business and ANTS Tennis coach training. Promotion of your Affiliate from the ANTS Tennis webpage. Support from HQ and the larger community through affiliate conference calls, and in-house business opportunities. What is the annual cost of an ANTS Tennis Affiliate? As of January 2014, affiliation cost $3,000 annually. Will my annual affiliation fee ever increase? Never. What you start with, is what you will always pay. If the affiliation fee increases, it will not affect you, only new affiliates. What is the process in becoming an ANTS Affiliate? Do I need to be an ANTS Certified and Trained Coach? Yes, but this is included in the initial two day training. How much does the ANTS Certification and Coach Training cost? And, will I have to renew? The ANTS Certification and Coach Training costs $1,000, and you will never have to renew as long as you are an Affiliate. Do I need a website to be an ANTS Tennis Affiliate? Once you are accepted as an affiliate, you will need to have a live website before we will be able to link you on the ANTS Tennis website. This is our primary tool to promote and drive customers to you. You are expected to maintain a professional website. Please DO NOT register a domain with the ANTS Tennis name in it until AFTER you have been accepted as an affiliate. ANTS Tennis is a licensed trademark and it is illegal to use it without our prior permission. What website software do you recommend? There are several options: Squarespace, Wix, Wordpress. Remember this will be the face of your affiliate, it is important to build a site that looks professional and is easy to use. DO NOT USE A "FREEBIE" WEBSITE WITH CORPORATE ADVERTISING. How do I collect registration fees? There are several options for collecting registration fees and organizing your registrations. Some suggestions are Allplayers, Active, or building your own with your website builder. If I purchase the website URL, does that mean that I own that name? You may own the domain, but the use of "ANTS Tennis" in your domain is unlicensed and illegal, and we can legally force you to give it up. ANTS Tennis LLC only acknowledges the URL of the name that you have licensed from us. If you own a URL containing a ANTS Tennis name for which you have not been granted a license, it is useless to you. We seriously frown on individuals "land grabbing" more names that the one associated with their specific affiliate and doing so may affect your acceptance into the affiliate program. What does ANTS Tennis recommend of a website format? We recommend a site that it informative and up-to-date. This is best through a blog (either on your homepage, or easily accessible from your homepage). Blogs keep parents and participants informed about how they are doing! Do I need a tennis club or office to operate out of? No, there is no fixed way to open an ANTS Tennis affiliate. We have seen a very successful spectrum of ways people have started ANTS Tennis from people using city parks, gymnasiums, parking lots, school yards, tennis clubs to individuals renovating spaces or even building a facility specifically for ANTS Tennis. Many individuals have been very successful by starting small, establishing clientele and then growing into a defined space. We believe in providing entrepreneurs with the tools to generate cash flow with or without large initial overhead. Necessity is the mother of invention. Be creative. What equipment do I need to start my affiliate? Your affiliate and Coach Training will include your first set of equipment and curriculum. This can be your starting point. Once your business grows, so will the amount of equipment you will need. Can there be more than one ANTS Tennis Affiliate in a city or town? Yes. We do not limit the number of affiliates in any given area. Most any town or city has enough people to support numerous prosperous ANTS Tennis operations. We believe that the more affiliates there are in one area, the more public awareness there will be of ANTS Tennis and this is better for everyone. Affiliates that work together, pooling resources, ideas, and outreach capabilities to increase traffic, do the best. Quality, excellence, caring, and fun. The best marketing strategies we have seen is to be the best coach and tennis provider you can be. Care about the progress of the children and provide the best feedback, communication, and information to the parents as possible. Affiliates find genuinely caring for each individual child and parent combined with word of mouth are the most powerful marketing tools. What promotional materials can I use or will be provided from ANTS Tennis. You can use the ANTS Tennis logo along with the promotional materials that will be provided to you during the affiliate training. Further, you can link from your website to the ANTS Tennis website to provide your clients with more information. You cannot sell our t-shirts, but we encourage you to make and sell your own featuring your affiliate name and creative slogans. Logos and/or slogans from the ANTS Tennis HQ may not be used without prior permission from the HQ. As an affiliate, you can and should say that you use the ANTS Tennis methods, coaching techniques, and philosophies and that you are part of the ANTS Tennis extended family. You may not represent yourself directly or indirectly as a representative of ANTSTennis.com, ANTS Tennis HQ, or ANTS Tennis LLC. 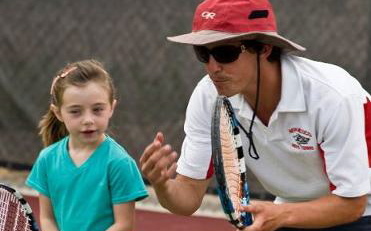 I am a tennis instructor, can I call myself an ANTS Tennis Coach? No, you cannot use the ANTS Tennis name, slogan, are work, photos, or content in ANY OTHER business or promotional way unless you are an affiliate. ONLY affiliation gives you the legal right to use the ANTS Tennis name for business and/or promotional purposes. How should I select a name for my ANTS Tennis Affiliate? Can I set my own rates for programs, lessons, groups etc.? Yes, but we encourage you to research the local area. Find out what you can set your rate at without being too low or too high. How much should I charge for registration? This is for you to decide. But remember you are offering a professional service that deserves a professional rate. Take time and look at prices on the ANTS Tennis website and do you market research to see what other organization are charging for similar services. Yes, in order to complete your application for affiliation you must fax us proof of insurance. You will need liability insurance and you will need to name ANTS Tennis LLC as an additional insured. if I use an existing facility (tennis club or school) to provide ANTS Tennis and they insure me, will I still need insurance? Most likely, you will need to name ANTS Tennis LLC as additional insured. Consult your insurance agent. if I want to coach tennis not for profit, do I still need to affiliate? Yes. By affiliating your are licensing the ANTS Tennis name and making it legal to use that name; whether you make money from your endeavors or not you still need to affiliate. If I'm going to operate as a non-profit, does my affiliation fee get waived? Can I submit images or video to ANTS Tennis to be highlighted on the ANTS Tennis webpage? Yes! If you have something (a great point, an awesome rally, a stunning serve) submit it to us and we will highlight it and your affiliate on our home page! No. ANTS Tennis affiliate are united around delivering fun, instructional, positive tennis to Americas's youth. Our affiliates are a confederation of legitimate tennis coaches pooling reliable resources. Have fun. You need to enjoy coaching children and growing the sport of tennis. Children and parents will see and feel this, thus helping you grow. Include you clients in activities outside of their typical tennis sessions, ie park BBQ and play day! Start small and grow in steps - Start in a small cheap or affordable space. Once you can afford a larger and nicer space, take the step. Use school campuses and local parks. Needing more space means you are building. Build slow, strong and steady always focusing on excellence. No need for tennis courts when you start. Use parking lots, basketball courts, industrial space, or flat concrete yards. Focus on the entire group of children, as well as the individuals. Always cater lesson plans so that the whole group is engaged. Start with the basics. Make sure children are learning quality fundamentals before you advance. Solid fundamentals will allow children to have more fun once they get to a more advanced level. Use resource that are in front of you. You will come across parents whom have skills in many different industries: doctors, lawyers, accountants, and business professionals. Ask them questions, as they will be happy to give your advice and lend you a helping hand. Ask questions and more questions. Harness the information on ANTSTennis.com and ask questions when you have them. Take photos and videos. Use these photos and videos to help show parents of their child's progression and to attract new customers. These will also help document your work. Start one-on-one then advance to groups. it is easy to jump right into group lessons, be be sure to hone in on your coaching abilities before to take the jump into group lessons. Coach with purpose. Build all of your programs so that they are progressing to achieve goals, then conquer those goals.